A region comprising the northwest of Africa from the Mediterranean to the Sahara, including Morocco, Algeria, Tunis, and Tripoli. The words "Barbaria" ( ) and "Barbarians" ( ) are found in the Midrash; in Gen. R. lx. the Barbarian is the neighbor of the Ethiopian ( ); and in Sifre, Deut. 320 (ed. Friedmann, p. 137a) Barbaria and Mauretania are mentioned side by side. The Arabs also (Yaḳuṭ i. 543, 9) called this region "Barbara"; and this name has become common in Europe. In later Jewish writings, however, the region is commonly called "Africa" (Abraham ibn Daud, in "Sefer ha-Ḳabbalah," ed. Neubauer, pp. 68, 73), but occasionally also "the land of the Philistines" (l.c. p. 60; Ibn Ezra on Dan. vii. 4), because, according to the legend found in the Byzantine writer Procopius, the Canaanitish (Palestinian) races who fled before Joshua afterward settled in North Africa. Sometimes "Africa" means only the former Roman province of Africa; while the rest of Barbary is distinguished from it under the name "Ma'arab" (Maghreb; Abraham Zacuto, in "Yuḥasin," ed. Lon don, p. 209a, 211b). Occasionally the name "Libya" occurs (Benjamin of Tudela). The inhabitants are called "Maghrebim" ( ) or "Mustharbim" ( ), and by a Spanish designation, "Moriscos" ( ; Sambari, ed. Neubauer, p. 116; an anonymous writer of the year 1495, in "Jahrbuch für Geschichte der Juden," iii. 218). Maghrebin Jews are now living in Egypt, Palestine, and Syria, but always retaining this name. The Moors call them "Yahoodi," and their language "Hebrani." No historical records remain of the first immigration of Jews into Barbary. The legends of the country say that they came direct from Jerusalem; and, in fact, they were found all over northern Africa at the time of the Roman dominion (Schürer, "Gesch." 3d ed., iii. 19-26). In gaonic times Barbary was one of the centers of Jewish life. The Jews sided with the conquering Arabs against the Christians, though it occasionally happened that the Berbers and Jews combined against the Arabs, as in 688. Legends mention in this connection a Jewish tribe called "Jerooa," under a Jewish queen. Many Arabian tribes bear unmistakable traces of their Jewish. origin, and these are still treated with a certain contempt. In addition to the Jews from Palestine, the Jewish population of Barbary is largely composed of immigrants from Spain and Portugal. The "Spagniols," indeed, constitute the better class, and live mostly in cities; while the others lead a nomadic life in the Atlas mountains and beyond, being found far within the Sahara and even among the Kabyles. InTunis there are also many Italian Jews. The majority of the 400,000 Jews now (1902) resident in Africa are living in the Barbary States (H. Schurtz, "Katechismus der Völkerkunde," p. 326, Leipsic, 1893). 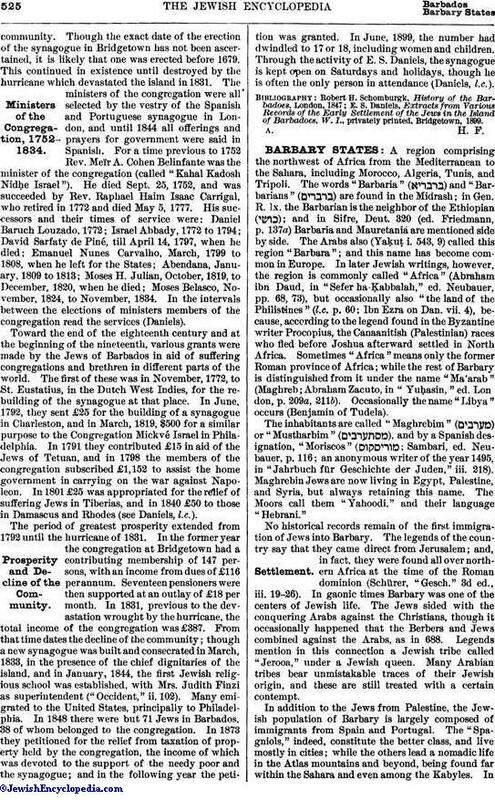 All reports agree that the Jews of Barbary represent the unmixed Oriental Jewish type. They are strong and well built; their women are beautiful; and, since they have always been hated and oppressed, it is impossible to assume in explanation an admixture of other races. In dress, mode of life, and general customs they follow the Arabs. They are strictly religious, observing to the letter the commands of the Bible and the Talmud; but, like all their neighbors, they are very superstitious. As an example of their severity, the place where adulterous women were stoned to death is still shown. The language of the descendants of the original inhabitants is Berber; that of the immigrants, Spagniol; but both speak also Arabic. Because of their linguistic attainments they monopolize almost the entire commerce of the country; and for this reason they are so much hated by the Moors that some of the tribes will not suffer a Jew among them. It is said that they have their own alphabet; since, because of religious prejudice, they object to the use of the Arabic script. A specimen of their writing may be seen in "L'Univers Israélite," 1885, p. 98. 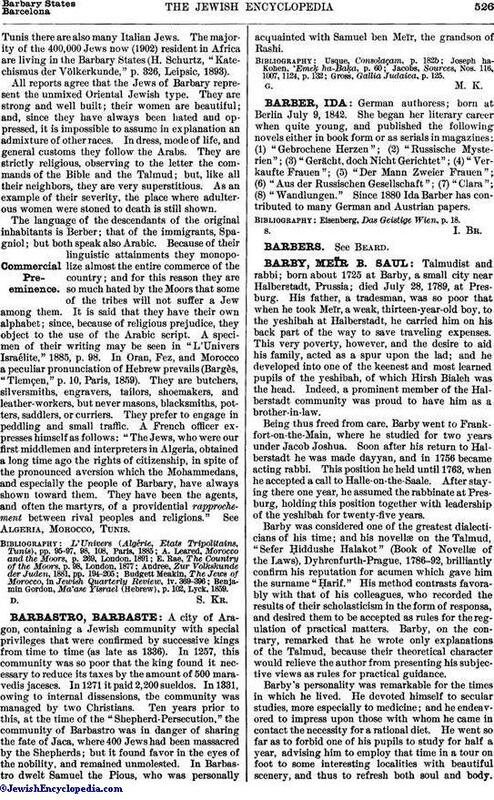 In Oran, Fez, and Morocco a peculiar pronunciation of Hebrew prevails (Bargès, "Tlemçen," p. 10, Paris, 1859). They are butchers, silversmiths, engravers, tailors, shoemakers, and leather-workers, but never masons, blacksmiths, potters, saddlers, or curriers. They prefer to engage in peddling and small traffic. A French officer expresses himself as follows: "The Jews, who were our first middlemen and interpreters in Algeria, obtained a long time ago the rights of citizenship, in spite of the pronounced aversion which the Mohammedans, and especially the people of Barbary, have always shown toward them. They have been the agents, and often the martyrs, of a providential rapprochement between rival peoples and religions." See Algeria, Morocco, Tunis. Benjamin Gordon, Ma'ase Yisrael (Hebrew), p. 102, Lyck, 1859.